The Smith Family, Leora Polar Saucerman, Midland, South Dakota, Upper St. Clair, USCHS, Upper St. Clair, 1967 Joy Saucerman Jones, Debbie Jones, Jody Jones. 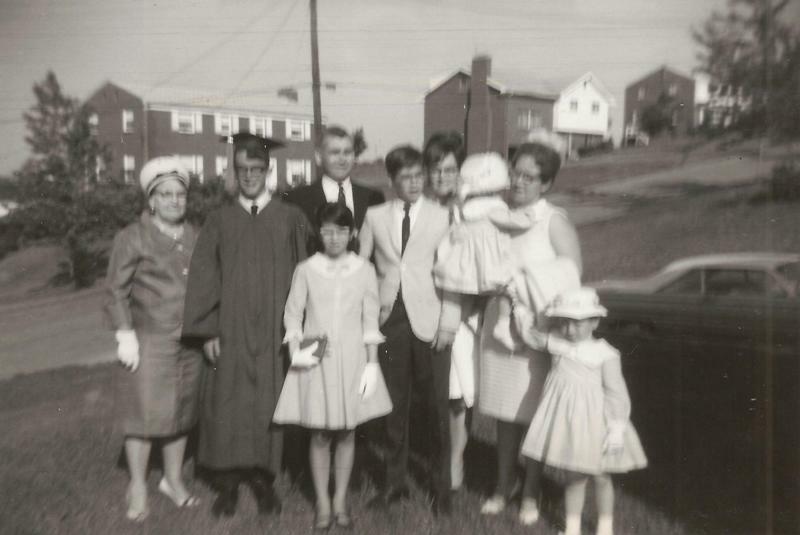 Pictured are my parents, Gloria and Albert Smith, brother Bradley Smith, sister Karen Smith, Grandmother Leora Polar Saucerman, Aunt Joy Jones and her two daughters Jody Jones and Debbie Jones. It holds great meaning for me that my grandparents John and Leora Saucerman along with Aunt Joy and Uncle Jerry Jones and their two daughters drove from South Dakota to attend the graduation. This was a trip of 1500 miles. I was the first grandchild of both my parents' families.